Batum started off his first and only game at the Reebok Eurocamp in very strong fashion, hitting a spot-up 3-pointer right off the bat. He handled the ball a bit in transition, grabbed some rebounds and went coast to coast, and played very aggressive defense. His excellent pull-up jumper from mid-range was falling for him at a really nice rate, and he quickly racked up double digit points early in the second quarter. As the game went on and things got slower and more congested in the half-court, though, Batums well-known flaws started to show. He struggled trying to create his own shot from the perimeter off more than a few dribbles, and then began to settle excessively for his long-range jumper, which just wasnt falling today (1/7 from behind the arc). He looked visibly frustrated after being blocked emphatically at the rim by Serge Ibaka and even missed a dunk at one point, as he surely was putting a lot of pressure on himself knowing that this was going to be the only game hell play in. Its pretty obvious that at this point in his development (as weve stated before) Batum is not going to be any type of go-to guy for any team he plays for, and thus needs a great point guard and a real system to take advantage of his excellent tools, things you arent going to typically find in this type of setting. At the end of the day, teams know what Batum brings to the table as a prospect (length, athleticism, tremendous versatility, a huge upside) so this probably wont affect his stock that much either way. He certainly deserves props for not being afraid to come out here and show himself, and the thing that was widely considered to be his biggest weaknessaggressivenesswas surely not an issue today. perhaps some softness(?) mixed in with stretches of impressive play that only a freakish athlete like him is capable of deliver. Unlike Gallinari, Batum hasnt been able to emerge as the team leader Le Mans needed in order to overcome a pretty forgettable regular season (2-12 record), especially considering the very poor situation they had at the point guard position and the excellent creative skills Nicolas enjoys. But he barely ever came up aggressive enough to command his teams offensive efforts for long periods. He wasnt fearless enough attacking the basket, and his jumper is still a work in progress. And particularly, he disappeared again from the court in crunch time with concerning regularity--which didnt help his team avoid some painfully close losses. However, whenever he figured things out, he really impressed with his abilities. The guy can be simply unstoppable, able to create his own shot at will, to easily set up his teammates for easy baskets, to play lock down defense taking advantage of his freakish wingspan and athleticism, and come up with a slew of highlights in the form of blocks, dunks, long-range off-the-dribble shots, etc. Batum needs to realize that hes the clear-cut best player on his team, and start playing accordingly. It would be a crime to waste such an impressive collage of basketball goods. Indeed, he should be a lock for the lottery, but even if we can easily project him there, theres no solid ground to protect him from slipping, given the concerns his game draws. Although his team Le Mans couldnt win any of the games played this past week, Nicolas Batum is back to showing his best face, running for a three-game streak where he scored over twenty points in each contest. Concerning only the last week, he started with 24 points, 4 rebounds, 4 assists and 2 blocks against Maccabi Tel Aviv in the Euroleague, following with 21 points, 2 assists, 5 steals and 2 blocks in the close road loss against Clermont in the domestic competition. We had the chance to watch Batum against Maccabi, where his superb execution stood out. Indeed he stayed perfect from the field, a rare circumstance, especially if he shoots from long range. He connected on a couple of spot-up treys, but also netted an off-the-dribble bomb released over the head of a shorter opponent. All in all, hes looking more reliable and comfortable from the arc these last couple of weeks, but theres no assurance yet that this trend will continue. Another interesting characteristic in his game against the Israeli powerhouse was his post game. Twice he took his match-up to the post, and twice he came up with excellent results. The first one, in the low post, finishing with a right-handed hook shot (not the most orthodox around, without much elevation, but still effective given the size differential he enjoys); the second one, in the mid post, using a pivot move to beat his opponent and deliver a layup after an excellent extension. Theres no need to stress the great potential a long guy like him enjoys playing with his back to the basket, especially if hes evolving at the shooting guard position. On the negative side, he didnt look very effective trying to beat his opponents off the dribble, although he was usually guarded by much smaller and quicker players (Maccabi fills the backcourt with combo-guards very often this season). The problem continued on the other end of the court, as he couldnt always stay in front of those small perimeter players he had to guard. The rest was there, such as his excellent passing game (he threw a terrific assists across the lane, found his open teammates easily, and fed a bunch of cutters), ability to run the floor or his above-the-rim plays (a put-back dunk off an offensive rebound for example, and a couple of terrific blocks). He was also unusually active cutting towards the basket during the first half of the game, which provided him with a couple of easy baskets. Weve spoken about everyone already except for the most interesting prospect on hand here in Le Mans (and possibly in all of Europe), Nicolas Batum. After a pretty lackluster showing against Milano in 19 foul-plagued minutes, Batum came back with one of the best performances possibly of his professional careerjust on time as far as I was concerned personally. Batum scored in a variety of different ways in this game. His 3-point stroke was definitely on, coming off screens on separate occasions and knocking down two pretty difficult looks-- catching, elevating, shooting pretty fluidly and hitting tough shots. His shot looks to be improving all the time it seems, even if his mechanics arent perfect, hes clearly putting in a ton of work from what we saw over the four days we spent here. Even if his 3-point shot is still streaky (29% in France, 23% in the Euroleague, 14/53 total), his mid-range game is looking as deadly as ever. Coach Vincent Collet (who really seems to enjoy working with the young players here from what we can tell) is putting in a ton of time on an individual basis with Batum every single day, working with him on all the little things he needs to improve on to be successful in the NBA. The part of his game that he seems to be stressing the most (besides the mental aspect) is his in-between game, which could become a lethal weapon in the NBA for a player with his tools at his position. Blessed with fluid and quite freakish athletic ability (combined with the high release point of his shot), Batum is capable of creating separation from his defender and through his pull-up mid-range jumper almost whenever he pleases. He found lots of success in this game by utilizing a sweet crossover move leading into a smooth pullup jumper from 17 feet. Being just an average ball-handler at the moment, and thus not the most dangerous shot-creator in the half-court, Batum is forced to rely on other parts of his game to produce offensively. We saw him do that in this game by moving off the ball intelligently, finding seams in the defense, and making sharp cuts to the hoop, as well as by being his typical spectacular self in transition (where he truly excels). Batum is the type of player who could really benefit from having a point guard with outstanding court vision, something he lacks here in Le Mans. One play that stood out in the Milano game was on a 3 on 2 fast break where he was streaking down the floor begging for a good lob that he could flush home. Instead, Raviv Limonad (a very talented scorer in his own right) threw up a wild pass that was not even close. Batum could get 4-6 points in this fashion just by moving off the ball every game, and this certainly seems to be an area that the free-flowing style of the NBA could benefit him. Although the players around him arent particularly gifted passers, no one can say that about Batum himself. Thats something we saw on a constant basis, whether it was through his excellent post-entry passes, his drive and dish plays, or just his lightning quick decision making as a key cog in his teams half-court offense. This is both a blessing and a curse for a player like him, since hes clearly able to make everyone around him better, but at times youd wish that he would just be a little bit more selfish and get his team the easy two points. Sometimes you wonder if its just a lack of aggressiveness he suffers from, while in others you begin to wonder if hes simply afraid of taking contact at the hoop, something that he clearly avoided in both games we saw. He had a chance on one play for example after an offensive rebound in the paint to go up strong and finish emphatically (he would had have absolutely no problem doing so), but instead, he decided to get cute and instead flip the ball to a teammate inside the paint for him to finish instead. This is a bit of a trend as far as we can tell with Batum. Hell have an open lane to the basket sometimes and will barely look at the rim, or in certain minutes as he did during the Milan game for example, will just completely fall asleep on the court and barely make his presence felt. We saw both sides of this in the Euroleague and French league games this week. In the Euroleague, he didnt grab a single rebound in 19 minutes, while against Nancy, he came away with 9 in 40 minutes. Defensively, he did a very good job for the most part (his tools are just outstanding here), but there were a few moments that he looked a little too laid backexactly his nature off the court by the way. Growing into his terrific frame will help him fight through screens, and might make him tougher finishing around the basket too. Whats scary is that a player like Batum can warrant so much criticism after producing such an excellent stat-line (he also added 5 assists to go along with his 25 points and 9 rebounds). That might give you a hint as to how much potential he still has at his disposal to tap into. His ball-handling and perimeter shooting skills are still very much improvable, but hes already an excellent player as it is. He really does remind quite a bit of Rudy Gay, although he probably possesses an even better feel for the game. To really reach the type of success we can surely envision as a do-it all, 3rd option Scottie Pippen-type role player, hell have to land in the right situation, with a good point guard, and a coach that likes to play up-tempo. Hell also have to be pushed quite a bit to get there, since he might not be able to get there if hes on his own. We must say that hes clearly making some important strides in this very valuable extra season he decided to give himself in Le Mans. It took Nicolas Batum just a few games to gear up and become arguably the best player in Le Mans this season. Thats right, the French swingman is showing an excellent level lately. Its often impressive how many different and positive things he can do on the court for his team in relatively short spans of time. It makes sense. Its no secret that Batum enjoys a god-gifted physical-athletic profile, but also hes a very skilled guy with a natural talent to play the game. Its a killer combination thats beginning to work with increasing consistency. After a couple of so-so games, hes averaging 17.7 points, 6.3 rebounds, 3 assists and 2 steals in the last three games of the French League. Meanwhile, he also shined in the Euroleague opener against Maccabi Tel Aviv, delivering an all-around performance with 9 points, 3 rebounds, 5 assists and 6 steals. For some stretches, he was all over the court. Filling a similar role to the one he enjoyed in the French U-19 National Team, Batum is emerging as an important catalyst in Le Mans. Hes the guy generating opportunities for his teammates with the most consistency. Extremely difficult to contain given his ball-handling skills, quickness and first step, he usually gains advantages for his team just by attacking his opponents off the dribble, while hes showing excellent decision making and nice court vision to pass the ball as well. Actually, this is often his first option, and unless he can go all the way for the dunk, or finds himself clearly open for a short shot, chances are he will first look for a teammate. Hes still managing to produce points at a good rate, but never forcing the issue. He just takes advantage of clear slashing situations, second chance options after attacking the offensive glass (looking really active here), knocking some perimeter jumpers here and there, being pretty energetic in general, and usually in the right place. His erratic long-range shot might be the main factor slowing him down. With a consistent stroke, its scary to think the impact he would have on the game. How would you deal with a (likely) 6-9 very athletic shooting guard who is so hard to stop off the dribble and finds his teammates so easily, if he could also knock down his perimeter shot? Actually, its really difficult to prevent Batum from releasing the ball from behind the arc given his size and ability to create separation from his defender, so whenever he eventually finds regularity there, its going to make some serious noise. Anyway, back to reality, we should not forget the character issue. Batum is well known for his mental struggles when it comes to staying competitive all game long. He tends to disappear and hes sometimes not particularly aggressive trying to make things happen. However, we do have to stress that hes looking pretty active in the last games, and even if you wish he were a bit more incisive and fearless looking for the basket himself, hes getting excellent production and is greatly helping his team. Batum is not only about offense--hes also doing a pretty good job on defense as well. Hes spending long stretches at the shooting guard position, and his ridiculous wingspan and athleticism become really annoying for any opponent. He might sometimes trust his length and athleticism excessively, and his ability to quickly reach any part of the court, and therefore not also maintain complete attention on his opponent, also conceding him more room than he should. Against Maccabi, he was caught off guard a couple of times, and thats a luxury you cant afford when the guy distributing the ball for the rival team is Nikola Vujcic. Anyway he almost always has a positive impact. Hes playing good team defense, is working the passing lanes, and you can even see him flying to block some shots. For a backcourt player, hes just a force in the rebounding department; hes actively working the glass and can virtually grab the ball off the roof. Its difficult to picture any significant change in Batums game for the near future. Hes not depending on any real momentum (a good shooting run, for example); its just a product of his gifts and work. Only some issues with his confidence could hurt him at this point. On the contrary, chances are he will keep looking better as the season advances, especially if he gains some steadiness with his shot. Therefore, barring a big surprise, we can probably consider him a near-lock for the lottery if he decides to declare for next years draft. Despite all the criticism or blame he might have taken during the tournament, Batum was hands down one of the very best players of the championship, an orchestrator for France, working on every area of the game. Yes, he might have deferred in the scoring department and eventually shied away from the ball down the stretch, but theres a lot more to talk about his performance, and always on a positive note. Hes probably the most physically gifted player seen in Novi Sad. His combination of size for his position, smooth athleticism and NBA frame was unmatched. Hes slowly getting stronger, already showing an extremely intriguing body, and whenever he decides to put serious work in that department, he will quickly gain all the strength he will need for the next level. Regardless of his relatively low scoring average, Batum was an extremely important piece on the offensive end, often the catalyst for his team --breaking defenses off the dribble to feed an open teammate. A very solid ball handler, enjoying an excellent first step and long strides, his opponents can barely keep him under control, so Nicolas forces continuous defensive rotations. At some point, his teammates might have been better off him attacking himself themselves, but its indisputable that he made things happen for France, showing a great basketball IQ in the process. Still struggling a little bit from long-range distances, his shooting production was inconsistent, but he shows excellent ability to create his own shot, as he can effortlessly pull up off the dribble to release a jumper over his defender with very low chances of being contested. Leading France in assists and steals, second in rebounds, Batum was all over the court. His defensive display was really good. His combination of length and lateral quickness is a nightmare for most opponents. He could virtually match-up with any guy from the point guard position to the power forward spot. Hes also an excellent team defender, very active using his long arms in the passing lines, and a terrific rebounder, always alert to clean the glass and willing to use his athleticism. Back to his mentality, he might not be able to become a real go-to player at the top level, but he could easily emerge into a superb team player that every coach would love to have on his team. Curiously, the best performer and a very big reason why France hasnt fared better answers to the same name: Nicolas Batum. The Le Mans swingman has been a terrific team player. Defense, rebounding, passing... actually, its pretty impressive that he provisionally leads France in both assists and rebounds. He has consistently created for his teammates, usually with kickout passes, giving up his own scoring options. Sometimes he has settled for perimeter jumpers, but his long-range shot is not falling in (quite a redundant problem for him). In the end, hes not showing up when his team is struck in the offensive end and needs points from its go-to player. We would like to see a more aggressive Batum, attacking the basket and taking more scoring responsibilities. Unfortunately, top-prospect Nicolas Batum only played the first game -he rested against Germany- and it's not like he put on a show. Actually, it was one of these typical games he delivers a bit too often where he goes somehow unnoticed. Anyway, he showed his talent virtually every time he touched the ball. He particularly did a fine job passing the ball, often off the dribble, as he found his open teammates easily. He came up with mixed results while shooting the ball. He enjoys nice range and certainly the ability to easily create his own shot; but he needs to gain consistency. With a solid outing on defense and rebounding, Batum will probably heat up as the tournament advances. Nicolas Batum is enjoying more prominence in Le Mans' rotation ever since coming back from his successful Hoop Summit showcasing. You might say someone might have realized what they have on their hands --which would be really sad, by the way; in our opinion Batum has always been ready this season to assume a bigger role on his team. He averages 29 minutes per game since that exhibition game, while previously less than 14 minutes. You might also think he was being hidden by his team, but I hardly believe in those theories about hiding players in international basketball. Anyway, significantly contributing to his teams victory, Batum had 17 points, 6 rebounds and 2 assists against Besançon and 10 points, 6 rebounds, 5 assists and 2 steals facing Bourg. Word on the Street: Ante Tomic Staying in the Draft. Nicolas Batum has decided not to put his name in this years draft, his agent Bouna Ndiyae told DraftExpress earlier today. A press release is expected to go out shortly in both English and French. Ndiyae told DraftExpress that Batum wants to have an impact in Pro A [French first division] first before leaving for the NBA. He wants to spend another season in the Euroleague as well, and is not interested in potentially sitting on the bench in the NBA next season. This is a personal preference for Batum, who says that he is not afraid of the scrutiny he will face next season as the top International prospect in the draft. He knows that he would be a lottery pick this year, but thinks that he has a chance to compete for the #1 overall spot in the draft after next season. Batums contract runs until June 2009, but we can expect some changes to be made to it over the next few days. For one, he will be assigned a personal trainer during the off-season to help with his overall skill level, as well as a shooting coach who will work with him throughout all of next year. He can also expect a very nice raise in his salary, but will still maintain a reasonable buyout for the NBA. 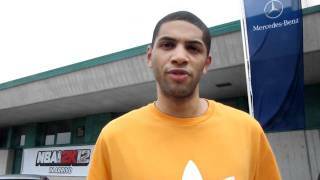 Entering the Hoop Summit, Batum was probably the best known player amongst the international prospects. He has since become likely to enter his name in the draft after a strong performance throughout the week, and will attempt to become a lottery pick this year. Throughout the week, he displayed flashes of great all-around potential, but rarely put it together for an extended period of time. When watching Batum practice, defense was clearly where he stood out the most. Good size, length, and athleticism in combination with excellent fundamentals make him a potential lockdown defender at the small forward position in the NBA. Offensively, Batum displayed good potential in many different areas, but was fairly passive in looking for his own shot during the practices. From behind the three point line, he shoots with questionable mechanics, but still appears to be a formidable threat out to the international line. Off the dribble, the left hand is another area that must improve. During the practices, he turned the ball over a number of times driving to the left while finishing many looks on the left side of the basket with his right hand. The low post could become another area for Batum to score from. He already made some nice moves with smaller defenders on his back throughout the week, and this could become an effective tool against smaller 3s in the NBA. In the game, Batum proved to be much more assertive on the offense end than anybody expected. Early on, he banked in a three pointer from the perimeter, but followed it up with a turnover trying to post up against Jared Bayless on the block. Two of the more impressive happenings on the offensive end came with under 3 minutes remaining in the first half. First, Batum drove left to the basket and dunked powerfully with two hands over Patrick Patterson. Less than a minute later, a fast break opportunity led to another impressive dunk for the Frenchman. The second half continued with Batum showing more promise as a scorer. A jumper from 17 feet on an isolation play opened the scoring for him in the second half, followed by a put-back dunk about 40 seconds later. After missing a 3-point jumper from the corner, he hustled down the loose ball, making an athletic save before stepping back in bounds and knocking down the second attempt from the corner for three pointer. Late in the third, Batum picked up his fourth personal foul, which really hurt the international teams chances of winning the game. Physical defense caused the foul trouble, and it led to a lot of time on the bench for him. The fourth quarter scoring for Batum didnt start until there were only a few minutes left in the game, and by then Team USA had already put the game out of reach. Offensively, Batum used his athleticism as an advantage in addition to showing some nice raw polish. His beautiful pull-up mid-range jumper looks NBA caliber and appears to be an effective tool for him at this point, and he knocked down a few three pointers in the game (though one was banked in as he was falling backwards). He opted not to slash to the basket more than twice, instead settling for points in transition as well as the jumpers. Overall, Nicolas Batum could become a starting small forward in the NBA in the future. His defensive capabilities combined with his outstanding athleticism and mid-range potential give him the edge on many small forward prospects in the draft this year. Batum has a chance at landing in the lottery this year, and also has the option of pulling out and trying again next year if he doesnt receive a promise in the lottery. It will be very important for Batum to find the right situation for himself as far as coaching and playing time goes. At this point in his career, he cant afford to spend 2-3 years toiling on the bench. Nicolas Batum played better than anyone else on the international team today, and was surprisingly aggressive in looking for his own offense. In the past, he seemed timid when it came to establishing himself as a scorer, but he made it a point to attack the basket off the dribble today. Starting in the half court drills, Batum started to take it to the hoop in certain situations, and attempted a few pull-up shots from mid-range with mixed success. As practice continued, he made a few drives where he made it all the way to the basket and tried to dunk over Solomon Alabi and Alexis Ajinca. He missed these attempts because he was fouled and it was a good chance to see how Batum uses his physical advantages on the basketball court. It was more of the same for the French small forward on the defensive end as well. He uses all of his physical advantages in addition to good instincts to pressure the opposing players on the court. Nicolas Batum continued his smooth play on the offensive end and lockdown defense on the other end of the floor. The power he uses near the rim has been impressive throughout the week, and his body helps him greatly in this area. Due to his physical features and athletic abilities, Batum displayed the ability to cover a lot of ground with little effort. Going to the rim, he can start at the three point line and get in position to finish with just one dribble towards the hoop. In the scrimmage he didnt look for his own shot off the dribble very often, though he was fouled on a drive early on, and made an impressive finish. Many of his points came off of nice cuts and good position near the basket. He only took 2 jumpers throughout the scrimmage, and displayed nice form despite the fact that neither of the shots found the bottom of the net. Defensively, he continued to put his physical attributes to full use. His quick hands lead to multiple steals, and he was able to block 2 jump shots out on the perimeter. Once he established himself as a shot blocking threat, the high school players stopped trying to shoot over him. It was just an average day of practice for Batum and he hasnt really displayed anything new, but his wide array of skills continue to make him the most intriguing international prospect on the team for the short term. Nicolas Batum had another great day as well, though he doesnt always stand out in the through drills. But he did excel on the defensive end, using his 71 wingspan and great body to apply pressure throughout the drills . His knowledge of how to play defense doesnt end here, however. Batum has great recovery speed, and displayed his knowledge of how to rotate properly while working in the halfcourt. When applying pressure in a zone full court press he also was able to create some steals. Offensively, Batum had a few explosive dunks at the basket that really turned some heads. When he slashes to the hoop he uses spin and hesitation moves to allow him the separation to finish strongly at the basket every time. Batums problem as a slahser at this point is a weak left hand. In some of the half court drills he was able to penetrate past his defender, but finished the ball with his right hand at the basket each time. The weaker left hand also creates problems off the dribble from time to time, where Batum is prone to either losing the ball or having it taken from him. Despite this, Batum has a really good all-around game. Some guys who are built like the young Frenchman shy away from physical contact, but he finishes with great power near the rim, no matter who is near him. In the half court drills, he also displayed the ability to overpower smaller guards in the post. After practice, Batum started shooting NBA three pointers, which he knocked down with some consistency. He hasnt shot the ball from the perimeter very often in the practices, but this appears to be a skill that he possesses. French small forward Nicolas Batum may be the best known prospect playing in the Hoop Summit this year, as he is considered a future top 10 pick by many people. His potential physically can be appreciated with just one glance in person. In addition to a great wingspan, Batum also has a well developed body that you can probably call NBA ready. Throughout the scrimmage, he displayed some fantastic flashes of potential, though they only came in spurts. On a dunk over an opposing high school player, he showed off his great leaping ability and body control that allow him to take contact well in the paint. Batum also displayed his ability to finish at the basket on a slashing move to the left side, where he hung in the air and finished a right handed lay-up to set up a three point play opportunity. Though he displayed good potential on offense, defense was the real intriguing part of Batums game today. Long arms, quick feet, and a strong body allow him to be a good defender, but he also shows good anticipation. Batum displayed great recovery speed when an opposing player had driven past him, but his quickness back to the ball allowed him to get a blocked shot from the side. Though Batum appears to have great potential to be a 2 way player in the NBA, you sometimes have to wonder why he doesnt play more assertively. This trend isnt as concerning in practice as it would be in a game situation, so at this point it is best to take a wait and see approach in regards to his aggressiveness on the floor. The prospect enjoying the best physical tools among all of the Euroleague youngsters, Nicolas Batum, has the most intriguing and natural characteristics that make the word "potential" sound more real than any other rookie from this season, besides maybe only Ricky Rubio. Batum is big, strong and athletic, with an impressive wingspan, great footwork and a natural NBA body already. He has already added some weight since the season started and everything is starting to come easier for him. He's begun to hit his open shots on a regular basis, and is moving comfortably more without the ball, even if he is still anxious and uncomfortable with the ball in his hands and often just tries to get rid of it as quickly as possible. Defensively, he is already there. Maybe a bit of an exaggeration, but he already seems as a defensive specialist for Le Mans, with all his amazing tools and excellent body use, being eager to help his team and only rarely getting outmuscled by opponents. Of course, Nicolas was never as an important piece for his team in his first Euroleague season. Besides some good all-around performances and a huge, 15-point game versus Olympiacos, when he made some important shots, Nicolas was a bench player who's job was to add versatility and defense while spelling his team's starters. He may have "stolen" some more minutes with a couple of active offensive games, but nobody really expected him to be more of a contributor this early. Nicolas didn't receive more playing time and probably didn't deserve to see more minutes, because he wasn't ready and his team is slowly developing him to become more of a contributor during the next couple of years, if he's to stick around. However, the best is yet to come and we may see a more improved version of Batum during the coming season in the French league, as long as his team decides to get him more involved in their offensive game and he decides to start slashing more and take better advantage of his explosiveness and physical superiority on the offensive end. Numerous sources have told DraftExpress this year to expect to see Batum's name in the draft when the early-entry list is released. Whether he stays in could depend heavily on how he closes out the season. It hasnt been easy for him. After a promising preseason, Batum was relegated in his team's rotation once the season started, mostly as collateral damage of the very poor results for Le Mans early on. However, after two months of very limited playing time, he has finally seen some light, getting season highs in minutes and points in both the Euroleague and French League this week. Le Mans showed nice competitiveness against the undefeated Olympiacos, staying close in the score during most of the game. Batum had 15 points, 4 rebounds, 2 assists and 2 steals in 25 minutes of playing time. On the domestic front, Nicolas settled for 7 points in 25 minutes, as Le Mans beat Strasbourg. In our opinion, it made little sense to keep Batum on the bench for that long. Hes not only a terrific project, but already a nice player. He sometimes struggled defensively, fighting through screens against Olympiacos, as he needs to gain strength, but everything else was pretty much there. Beyond that issue, he looked like a very able defender, making good use of his long body, not forgetting to help his teammates, and even managing to intimidate with his excellent wingspan and athleticism. On the offensive end, he committed few mistakes, took good (and quick) decisions with the ball in his hands, showed good passing criteria, displayed some of his (still a bit inconsistent) perimeter stroke and drew fouls attacking the basket. Hes definitely a useful player for Le Mans. After blossoming in the youth categories over the past few months (earning MVP honors in the European Junior Championship this summer), the timing couldnt be any better for his team Le Mans to make its debut in the Euroleague. It will be a perfect scenario for Nicolas Batum to showcase his excellent abilities and terrific potential. We should be able to see him enjoying already regular minutes despite his youth, not only considering the limited talent that Le Mans enjoys, but also because Batum is already a useful guy for this team. If we combine his skills and physical set, Batum has little competition among international prospects. Hes a long and very athletic wing, still a bit skinny, but who enjoys a very nice frame. At 6-8, hes even capable of playing in the backcourt, although he seems better suited for the small forward position. Most of the stuff Batum does on the court seems to come effortlessly. Hes a very fluid player, fundamentally sound, able to find good solutions in most situations thanks to his very complete skill set. A nice ball-handler, Nicolas can take the ball to the hoop showing a good first step, footwork and quickness, and finishes near the basket either with layups or dunks, taking advantage of his athleticism and body control while in the air. Batum is a solid passer who also shares the ball after splitting defenses and shows criteria moving it in the offensive flow. Hes a smart guy with nice basketball IQ. Not the best shooter around, he is at least a very decent one and enjoys really solid foundations nevertheless. Showing good mechanics and the ability to shot off the dribble (with a move thats really hard to stop), he will likely become a very productive player in this area. Defense is not a problem for Batum either. Perhaps he can eventually get outmuscled at the Euroleague level, but he has terrific tools to match up against his rivals, as hes a quick guy in terms of lateral movement, is really long with an excellent wingspan that can be very annoying for his rivals, and shows the right attitude. The biggest point of concern for Batum revolves around his coolness on court. He tends to disappear too often. He can enchain a bunch of spectacular plays and then go completely unnoticed. Hes not the most active guy on the basketball court when it comes to taking responsibilities. However, its not that much of a problem at this level, as he wont be asked by any means to assume a very significant role. He only needs to play good defense (which he usually does), be smart on the offensive end (not a problem for him), commit as few mistakes as possible (hes quite a reliable player) and take advantage whenever he has a good scoring opportunity (well see how he fares here). Alongside Ricky Rubio, hes perhaps the player with the biggest potential in the Euroleague. Batum, a 6-foot-8 swingman, was MVP of this summer's U-18 European Championship and is now playing at the highest level in France at only 17 years old. Bokolo on the other hand is a 6-foot-3 combo guard who entered the NBA Draft last spring before withdrawing, looking to prove to scouts that he can make the transition to a full time point guard. Born in 1985, last years runner up for Frances top young player award (behind Ian Mahinmi) will be automatically eligible for the 2007 NBA Draft. Nicolas Batum played only 16 minutes, but made his presence greatly felt. He wreaked havoc on whomever he was guarding with his freakish length and outstanding athleticism, and literally did not allow a single point to his opposing man by DraftExpress count for the time he was in. Nicolas rotated extremely well in help side defense, and used his great wingspan to register multiple deflections and one steal. His ability to change the game defensively was truly special for a player of any age, much less a 17 year old playing at the highest level in France. Offensively, the budding star was incredibly passive, taking only three shots the entire game. He knocked down his only three point attempt, and converted on one of his two 2-point attempts. It was evident that Batum could have made his presence felt more on the offensive end, as he broke his man down numerous times, but chose to kick the ball back out instead of taking it himself. Its clear to any fan watching that Le Mans had a future NBA player on their hands, although not matured quite yet. Batum showed why NBA scouts are so enamored with him, and displayed in his first game why many have him pegged as a lottery pick in the NBA Draft whenever he decides to come out. From what theyve told us, Batums camp has almost definitely decided to put his name in this years draft. He just narrowly qualifies as being eligible--despite the age limit--due to the NBAs rule of being 19 in the calendar year of the draft rather than when the draft will be held in June. Batum will be 19 years old in December of 2007. Whether it would be in his best interest to do so is another story altogether, as there is a lot to be said for coming to the best league in the world in a position to actually contribute somethingwhich Batum clearly is not and probably wont be for a while. Well surely be a lot smarter about where he stands as a prospect once he has a full year of Euroleague experience underneath his belt. This is a dilemma we'll surely be talking plenty about leading up to June. An extremely skilled player as well as a terrific athlete, Batum seems to play effortlessly, making impressive play look like they were just everyday things. He has barely left anything else for other players: as the champion with France, MVP of the tournament and the most promising prospect seen in Greece these days. His improvement from what we saw last summer was nothing short of remarkable, and his potential is still scary. Could we ask for anything more? It all starts with his impressive physical and athletic set. At 6-8 and enjoying a nice wingspan, hes quite long for a wing player. His frame is excellent; he already shows good strength, in line from what is expected for a 17-year-old player if not more, but theres also room for a lot of development. Its obvious that he has improved his body from last year, but hes not done by any means. In terms of athleticism, hes an extremely gifted guy. Hes quick, but especially a remarkable leaper, being able to perform some jaw dropping dunks. But the real intrigue hits when you match that physical and athletic profile with his splendid skill set. Hes very fundamentally sound, dominating the basics of the game. Almost unstoppable going one on one, Batum enjoy excellent ball-handling skills and a very good first step, while he easily reaches the paint with his quickness and nice footwork, including fakes or reverses. His athleticism and body control allows him to easily finish around the basket, either with layups or dunks, while sometimes using physical contact with his rivals to gain room. He also has the ability to effectively dish the ball off his drives, showing nice court vision and good decision making, as he very rarely forces his actions. Batum didnt show the best accuracy shooting the ball in this tournament, but you can see he has the mechanics and the touch to be productive in this area. He enjoys three-point range, can easily shoot off the dribble, and shows a high release point that is quite difficult to contest. His wide offensive repertoire also includes some low post skills, nothing too fancy, but solid enough to cash in near the basket off smaller defenders. On defense, he has all the tools to be more than effective: athleticism, lateral quickness, length, reactivity and some strength. He just should join the list of terrific defenders that France is producing lately. As a side note, he did deliver a few spectacular blocks, on the help and also in defensive transitions. He also did work in the rebounding department, staying aggressive in the offensive board. All in all, its an extremely intriguing package of physical exuberance and abilities that should allow him to consistently dominate games. Still, it doesnt happen. Batum is not a selfish player at all, sometimes to a fault, and for some stretches you might not even feel his presence on the court. He did try to take over the game against Iceland, but it was late and the difference too big to swallow. It was like a last-try effort, as France had miserably failed anything they tried to come back in the score. In other difficult situations, he didnt show up as much as desired. Its something Batum should work on; hes a guy that should emerge in a more prominent role, not necessarily taking more shots, but taking more decisions with the ball. Under contract with Le Mans for three seasons, we will be able to see Batum this upcoming campaign competing against the cream of international basketball in the Euroleague. The childish appearance of Nicolas Batum was well indicated in his status as the youngest player at the tournament. Born in December of 1988, every characteristic he displays has a considerably raw degree. Starting with his physical profile, hes still a skinny player who has a long ways to go in terms of growing into his body. However, his frame looks excellent, his wingspan pretty good and he still might gain a bit of size. Its the same story athleticism-wise: he features promising athleticism, but he needs to gain some explosiveness and reactivity. When it comes to his skills, again its not much different. Shooting, dribbling, passing, defense, he can do a little bit of everything but he must work hard on every characteristic of his game, although he has plenty of time to mature and polish his skills. In the end, he was practically a cadet playing with juniors. Regarding his shooting, Batun appears to have three-point range, but he was awfully inconsistent in Belgrade. At the moment its only a static shot, although he has decent form on his release. He doesnt work the mid-range area too much at this point; on the contrary, he likes to penetrate looking for the basket, displaying a fairly good first step and quickness, and some developing ball-handling skills. He lacks a certain ability to finish against opposition, so many times he opts to dish to a teammate, with mixed results, but showing decent basketball IQ in the process. Anyway, he doesnt look like too much of a passer right now. Defensively, he features the tools and shows the attitude to eventually become a reliable player. Meanwhile, he already proved to produce as a rebounder taking advantage of his length and positioning skills. As you can see, its mostly a bunch of vague characteristics and strengths, no sure and defined skills, just the glimpse of a promising future if he develops his game good enough. Indeed, even if were ranking him as a forward, and thats the most probable outcome, he might eventually evolve into a shooting guard. The potential is there, but hes one of the players seen in Belgrade with the longest way to fulfill it.